Opus 12 defies the conventional rules of watchmaking, giving birth to the most improbable mechanical concept. This exceptional timepiece deliberately overturns the perception of time by drawing its inspiration from the Copernican revolution according to which the earth rotates around the sun and around itself. Time no longer reads via a pair of hands positioned in the center of the dial, but by the peripheral drive of 12 pairs of hands going from the circumference to the center. The hands, pointed towards the interior draw attention to the center of time. A retrograde hand, synchronized with the main minutes hand, advances along a five-minute sector. At the end of its travel it flies back to its initial position while the long five-minutes hand pivots and sets itself still. The winding of the movement departs from convention. The crown must be turned in the counterclockwise direction to simultaneously wind up the two barrels, one providing energy to the movement and the other, to the animation. In order for the crown to be accessible, it has been placed in the center of the caseband, requiring a transmission wheel that reverses the winding direction. Opus 12 also breaks the rules in terms of decoration and finish, deliberately abandoning the chamfering used in traditional watchmaking. Shot-peening hardens the surfaces and brings a resolutely contemporary aesthetic. The "Côtes de Genève", visible through the sapphire-crystal caseback, are for their part interpreted in a spectacular manner. The styling remains faithful to the heritage of the House of Harry Winston. The emblematic arches recall the neoclassical vault which dominates the famous facade of the Harry Winston Salon in New York and the openwork hands, the Manhattan skyscrapers. Another feature of this Opus 12 is the absence of a traditional dial, which channels attention towards the indications and the animation and confers a mysterious character to this exceptional piece. 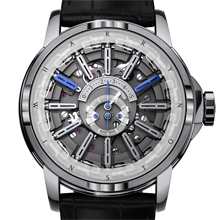 The Opus 12, which reinterprets time, is a real innovation in watchmaking. Nothing like this has been done before. The idea has sprung from the mind of its creator, Emmanuel Bouchet, who developed this remarkable work in close cooperation with the designer, Augustin Nussbaum, and the House of Harry Winston. Each of the 12 stations around the dial carries a long hand to indicate the five-minute intervals and a short hand to indicate the hours. The former rotates about its axis and the latter orbits the former to appear above it or hide beneath it. Each hand is attached to a driving wheel and each displays a blue face when it indicates the time and a neutral face when it is not in motion. The hands are activated thanks to two crown wheels turning around the dial. Both of them have toothed sections that engage the driving wheels of the hands at each station. The outer crown wheel, which activates the minutes hand, goes around the dial in one hour, advancing at five-minute intervals from one station to the next. A first toothed section engages the wheel of the next station and the five-minute hand turns over to its indicating side. In parallel, a second toothed section leaves the previous station and the minutes hand turns over to its neutral side. At the change of the hour, one witnesses a real spectacle. The inner crown wheel, which has not moved for 60 minutes, suddenly takes off around the dial and its toothed section drives the rotation of the hours hands in rapid succession. As the crown wheel goes around, the hours hand orbits 360° around the minutes hand station after station, and its blue color appears on the surface in a flash before disappearing again. The kinematics lasts for a few seconds until, after passing by the 12 stations, the toothed section drives the indication of the next hour and stabilizes itself. The speed of rotation is controlled by an escapement, which needs far less energy than a flywheel governor and which provides a captivating sound effect. 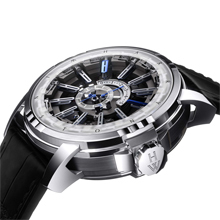 In fact one of the challenges of this Opus 12 has been to optimize the energy necessary for the precision of the movement and for the animation. The movement and the animation are fed by independent barrels. The barrel for the animation functions with the help of a differential that transmits the energy necessary for the travel of the crown wheels at the intervals governed by the movement. Both barrels are wound simultaneously, and the springs take the same time - 45 hours - to unwind. The movement stops when the energy required for the animation is not sufficient enough. Each barrel has a slipping spring to prevent any breakage at the end of winding. 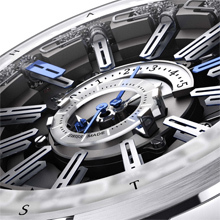 The powerreserve of both barrels is shown along an arc of a circle in the center of the watch. A balance-wheel, oscillating at 18,000v/h, allows the small seconds hand to advance in jumps of one fifth of a second. An incredible module accommodates the 27 hands and their associated gear trains. The outer crown wheel, which governs the 12 five-minute hands, forms a wall rotating around this module. The watchmakers therefore had to construct an outside transmission system to connect the winding stem, positioned at the base of the timepiece, to the crown, which had to be accessible halfway up the caseband. The transmission wheel reverses the direction of winding. The setting can only be made by advancing the time. The principal indications are thus the hours and twelfths of an hour. The five minutes that go by between each animation at successive stations are indicated by a retrograde hand in the center of the timepiece.